Have I ever mentioned I have bad hair? It's crazy thick, grows straight on parts of my head & curly on others. It's even multiple colors. Most of my hair is brown, or at least it was in my youth. But there are splotches of blond. And by "splotches," I mean it looks like someone splattered bleach on my head. These days, gray is added to the mix (although I still prefer to tell myself it's white blond) and my hair is just a complete disaster. I'm used to it though. My hair has always been a disaster. See? 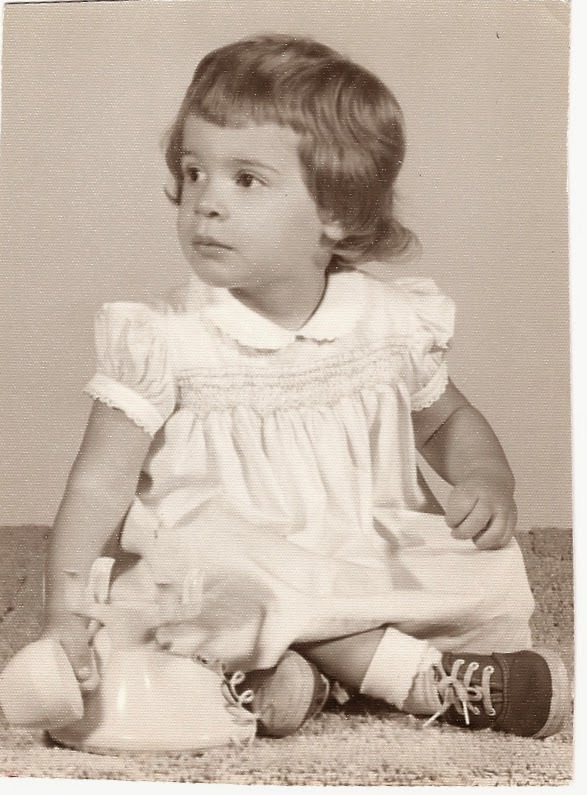 Not only was it crazy thick, curly in places & straight in others as a toddler, but to add a bit more humiliation into the mix, my mom cut it herself. With pinking shears. No lie! Pinking shears! I knit myself a hat to cover up the bad hair. It turned out to be a bad hat. I knit this hat while at work one day. It was a very slow day work wise. Have I mentioned how much I love my job? How I get to play with money all day and if things are slow & there's no money to count, I can knit? Right there, at my desk, in front of the boss! It's fabulous. As much as I complain about (1) having to go to work, (2) the hours, (3) the uniform...., I really do love the job. I just wish I loved to block knitting. That hat obviously needs a good blocking. I also knit this striped scarf. It's shades of browns, grays & creams. 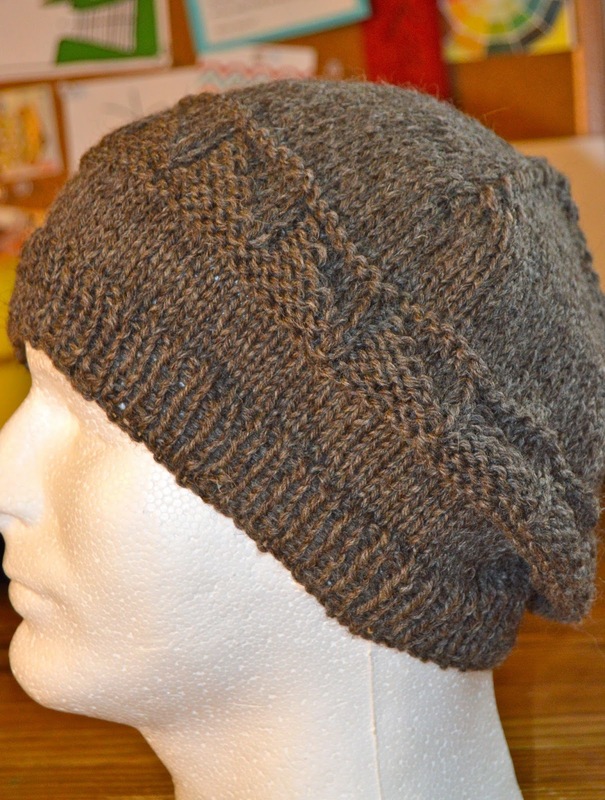 I love how the garter stitch blends the colors. It reminds me of the granite stone lining our driveway. 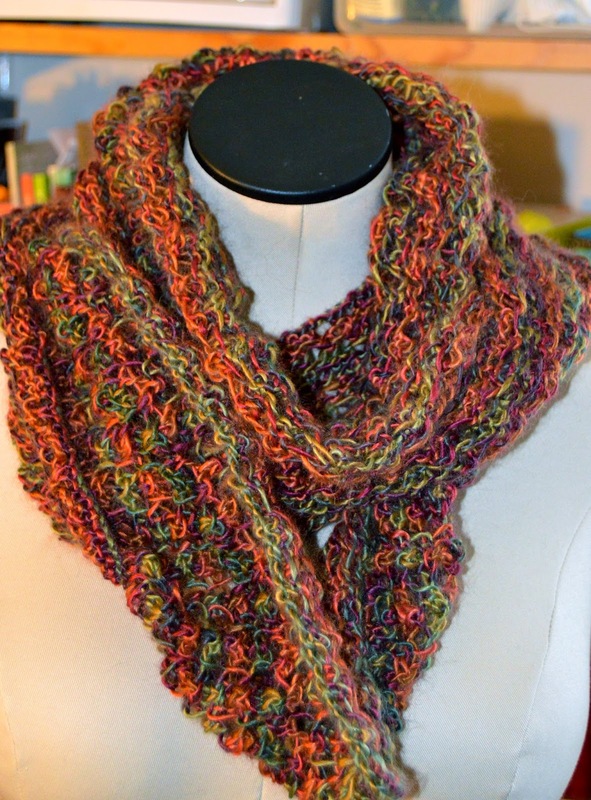 Next, I knit an autumn colored cowl. I LOVE the colors in this yarn, but that's about the only thing about this project that I loved. The lace pattern was a simple 4 row repeat but somehow I kept getting my rows confused. It may have had something to do with the fact that my daughter introduced me to a new series on Netflix. Have you watched From Dusk till Dawn? I suggest you don't if you are knitting "simple" lace that you don't have to pay a lot of attention to, because you won't. On top of the lace issues, the yarn was super splitty (it was an unspun type of yarn & I was using very pointy lace needles which may have caused the splittiness) and the bind off was too tight. All in all, it wasn't a very happy knit, but I do love the colors! After the autumn colored lace fiasco, I went back to the left over brown, gray & cream yarns. I had quite a bit of yarn left over after finishing the scarf & it just seemed easier to knit something else with the leftovers than to put them away. I am definitely in lazy knitting mode these days. Well, that pretty much sums up the knitting I've been doing over the last couple of weeks. Now, I'm off to see if I can't do something with my hair.